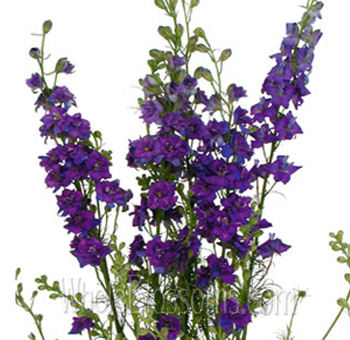 Larkspur comes in various colors such as shades of purple, blue, pink, and white. It is a member of the buttercup family and is known for its tall, slender heights and colorful small blooms that are densely packed together. 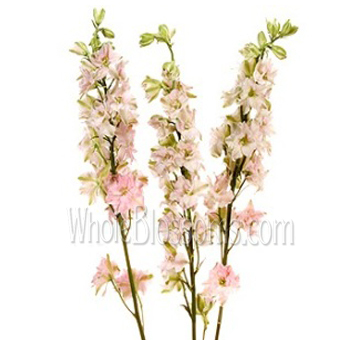 It is a fragile, yet popular flower that has a relatively short vase life, usually never exceeding more than a week. The larkspur flower is a genusof the buttercup family – Ranunculaceae. Itsymbolizes carefree summer days, lightheartedness and grace. Almost as complex as the Orchids Larkspur flowers consist of both petals and sepals. The irregularly shaped bloom grows in a loose vertical grouping along the upper end of the plants main stalk.They are a highly desirable cut flower. Their spiked petals and colorful flowers look perfect in a rustic setting as well as a cut glass vase. 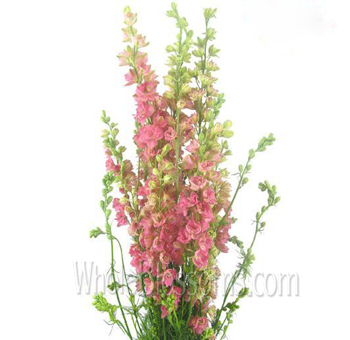 The larkspur flower is brilliant in the way that it comes in a vast range of colors. It can be a fantastic addition as well as a replacement for any traditional flowers. These flowering plants have minimal genetic barriers a when it comes to intercrossing and breed mixes. That's why larkspurs come in a range of hybrids in different combinations. As a result, you will see a wide variety of colors and same floral structure in shades of red, pink violet and even white. Many people get confused between Delphiniums and Larkspur. However, they are not interchangeable. They both belong to the buttercup family but larkspurs are more delicate while delphiniums have more substantial flowers. Larkspurs grow in the Northern Hemisphere as well as some places in the mountainous and tropical regions of Africa. Bakers Larkspur and the Yellow Larkspur are native to some areas of California. Unfortunately, they have been federally listed as an endangered species. Most of the Bakers Larkspurs are entirely cleared out by the road crews.The larkspur plant is extremely toxic. The stems and seeds of the plants have alkaloids. It's isn't recommended to take larkspur internally as all parts of the plant are toxic to human beings. If ingested by animals it causes vomiting, nausea, and weakness. Surprisingly, domestic sheep are not at all affected by the plant, so they are often used to clear out farms where they are generally considered as weeds. Climates with cold and moist summers are generally very beneficial to larkspur plants. It blooms from early spring through to late summers and flowers ranging from a few inches to a few feet tall. Larkspurs don’t like to be transferred so if you’re planning to plant them make sure it’s in a location you want. The plants should be placed at least 6-8 inches away from each other. Once you get your hands on these beautiful flowers, there's a lot you can create with it. Larkspurs were once a trendy gift of the Victorian times. The symbolism of this plant runs deep, and each color of flower denotes something entirely different. Like a pink Larkspur means fickleness whereas white larkspur meansa happy go lucky nature, and purple larkspurindicates sweet dispositions and first love. Larkspur flowers have been mentioned in Greek mythology as well. Achilles’ mother requested that his armor should be given to the bravest warrior of Troy. When the armor was given to Ulysses instead of Ajax, he threw himself on his sword, and blue larkspurs grew wherever his blood dropped. In Shakespearean time this flower was even called larks heel, larks claw and knights spur. In Transylvania according to folklore dried larkspurs were kept ins tables to keep the witches away from the animals. In old England, Larkspur's were used to cure many ailments and even used during the celebration of the summer solstice. Native Americans and the European colonizers would make a blue dye out of their flowers. One of the most ancient uses of larkspur was to drive away scorpions. There is so much to learn and love about these species. Histories of flowers tell us a lot about our own histories. Larkspurs are beautiful flowers that only mean good things which makes them a great addition to your special event or wedding. These flowers have increasingly gained popularity today. There’s a vast quality market for larkspur cut flowers. Their appearance, colors, and lush foliage make it a very attractive and in demand flower. Because of which larkspur becomes a very marketable and aesthetic cut flower. Production for local markets is lucrative since the flowers last up till a week maximum. They tend to be a little fragile and short-lived. However, species of larkspur like Consolidaambigua and consolidaorientals make excellent cut flowers. 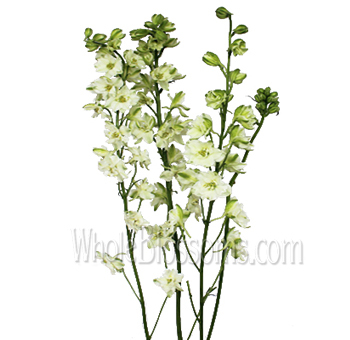 The Larkspur rose which is also called as Consolida ambigua has tall spite of rose-colored flowers. White larkspurs are high in demand for wedding clients, and the gorgeous purple larkspur gives the perfect accent to a special event. 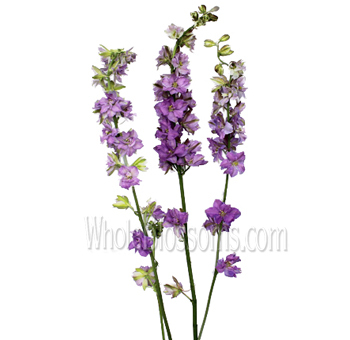 Finding larkspur flowers for sale is possible and actually very easy. All you have to do is contact a trusted online store. For that, we suggest you opt to go with a wholesaler called Whole Blossoms. They are renowned in the cut flowers trade and are extremely efficient. They guarantee fresh flowers delivery right at your doorstep. Whole Blossoms also has a 24/7-hour delivery system which is a life saver for event planners. We highly recommend them since they will provide the flowers in bulk, helping you stay under budget!